Recently my husband has been travelling a lot with work and I have been doing extra hours too, so the past few weeks have been a bit of a blur. I’ve been so tired and I mentally switched to ‘survival mode’. I felt myself getting weary and negative so when I realised I had this Saturday off work I was over the moon. I thought I would have a nice lie on, hubby would take the kids to rugby, I’d get caught up on laundry and the many other domestic necessities that come with family life. It didn’t quite work out that way however. 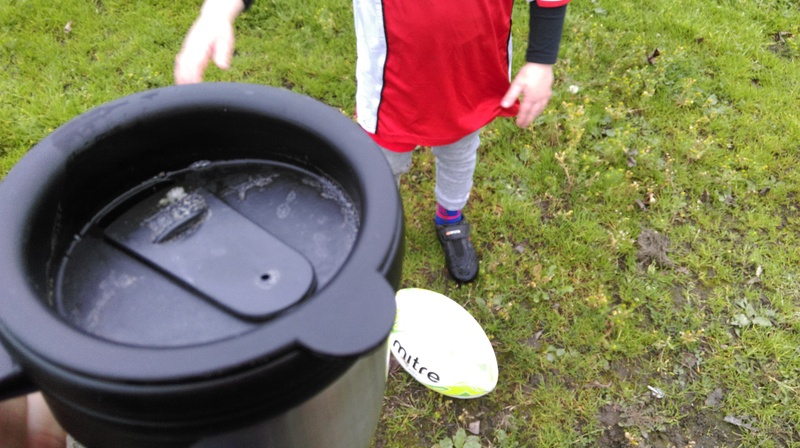 Two of the boys had a rugby match at one location and the youngest had training at their usual home ground so I was roped into bringing him to training. I’m a little embarrassed to admit I didn’t really want to have to do it. It’s not that I didn’t want to see him play, or that I don’t like standing at the side of a muddy rugby pitch for hours, just that there were a million other things I knew I could be doing during that time. Anyhow, we got up (early), gathered up the gum shields and bottles of water and we split up and headed off in our separate directions. Thankfully, the morning was dry and bright and child number three was super eager to show me all his ‘new skills’. When we arrived he bounded out of the car and went to help the coach set up. I stood back and watched, suddenly aware of how grown up and capable he had gotten. When had that happened? Once they started training, it was visible how pleased he was to have me watching. He smiled the entire time which was so heart warming. I listened to the kids laughing. I listened to the coaches patiently instructing and explaining. Something was happening to me. I was feeling refreshed and revitalized. The sun broke through the clouds and the morning became something glorious. After the game, my son came running back to me, cheeks rosy and his face beaming. ‘Did you see me, Mum?’ I certainly did see him and something had changed in me. The heaviness of the past few weeks had floated away and all I had done was get out of the house for a few hours. I had witnessed my son having a great time with his rugby pals and I had had a super relaxed morning. When we returned home the other boys hadn’t returned from their matches so we headed out to the garden. I brought some of my workout gear – skipping rope, light weights and a resistance band. With my husband away so much, and no babysitters at hand I hadn’t had a chance to get out to my usual training sessions and I realised suddenly how much I had missed it. With my energy levels increased I did a mini workout, with my son joining in. We had a good laugh, talked about staying fit and healthy and just enjoyed being together. We are off now to buy suits for my brother’s upcoming wedding and everyone is in great form. Those few hours spent shaking off the cobwebs have restored my wellbeing and the time I had with my youngest son is stored in my happy memory bank forever.